Boy George disputes with fellow judge Seal on The Voice. 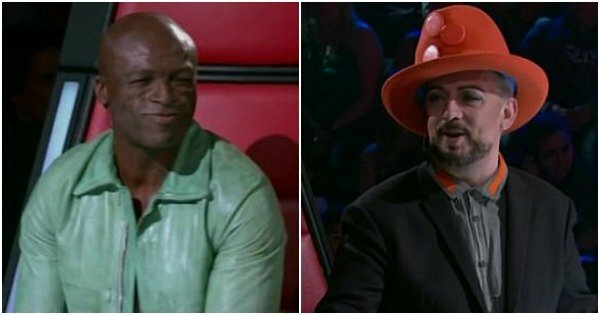 "Don't threaten me, babe": Boy George and Seal's tense exchange on The Voice. Last year it was Jessie J and Delta Goodrem whose spats stole attention from The Voice competitors, but this year it’s the male judges who just can’t seem to get along. Things got heated off-stage during Sunday’s episode of the Channel Nine reality singing show as legendary artists Boy George and Seal competed to claim tradie, Rennie Adams. The 31-year-old aspiring singer’s voice prompted all judges to press their buzzers and Boy George was not about to let Adams go to Seal without a fight. “Seal always says this like he’s the only one up here that can do that,” Boy George said about his fellow judge’s promises. Seal responded by boasting of his past success on the show. “George, do your Googles mate. I’ve won it twice,” the 54-year-old said. After Adams chose to join Seal’s team, the singer offered a sarcastic fist-bump and said warned his co-host to “be very careful”. And if you were afraid that would be the end of it between the pop icons, never fear. Boy George promised he could make Jessie J and Delta’s infamous feud “look like bloody puss in boots”. Who is your favourite judge on The Voice?